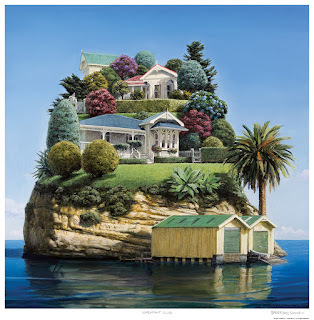 A decade ago artist Barry Ross Smith created a series of artworks that were hailed by critics as "hymns to rural New Zealand", there followed a collection of top selling prints that sold to city and country folk alike. His finely realised portraits of NZ farming life were informed by his deep personal roots in the country, at the time he lived and had his studio on a farm - this was authentic rural NZ art that stood up to the scrutiny of those with an expert eye for farming matters. It is always hard for an artist to move on to a new phase of work. Not just the difficulty of finding a new theme to explore at a professional level, but also the buyers of their work want them to keep ploughing the same field long after the artist themselves may have moved on in their work (Bill Hammond and his bird paintings for instance, he's over birds but these are the ones that collectors demand). Barry has successfully and cleverly moved to a new and innovative series of paintings that we really like. The New Zealand landscape imagined as a series of islands. The story of Aotearoa/NZ is the story of island isolation, of huddling together on rocky outcrops in the Pacific Ocean. There is an element of the slightly surreal about Barry Ross Smith's island series which lifts them out of being just another photo realistic painting that is essentially just a reproduction of the NZ countryside, an honest and competent depiction of a scene but lacking the mystery of the very best kiwi landscape artists such as Grahame Sydney (who as an aside recently gave us the glorious phrase in response to the work of another artist, "Well, x is a good amateur, but a poor professional"! ). These prints are refreshingly different and look great on the wall hung as a series (coherent but not to matchy matchy). They are also well-priced, at just under $60 per print. These new prints are saying something more than just what you see, raising interesting questions about the evolving kiwi identity as the 21st century advances. And although this series is a significant advance on what has become very tired nostalgic white bread kiwiana, it's similar in spirit to that which energised the popularity of kiwiana art for NZ homes over the last 20 years, a low key but deeply felt appreciation of our unique NZness, with a light touch, almost but not quite an in-joke (perhaps the wry smile) that only Aotearovians fully appreciate.